Petra Kvitova battled through the heat. AUSTRALIAN Open officials have come under fire for ignoring extreme heat forecasts and needlessly throwing players into the furnace of an open-roof Rod Laver Arena on Thursday. 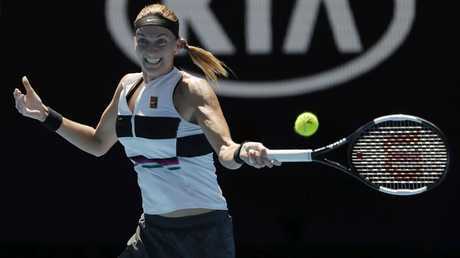 The opening women's semi-final, won by Czech star Petra Kvitova over unseeded American Danielle Collins, had to be delayed as play on all other courts was suspended indefinitely as the new heat scale rating soared above 5.0. The Rod Laver Arena thermometer also tipped over 38C in the shade. The Bureau of Meteorology earlier predicted the mercury would reach 36C in Melbourne - but officials made the decision not to take action and opened the centre court roof just minutes before the start of the semi-final at 2pm (AEDT). That call was almost immediately exposed as a shocker as the heat stress scale climbed to 4.3 by the start of the match - a reading that allowed players an extended 10 minute break in between second and third sets. The heat stress scale hit the dangerous level of 5.0 just a few minutes later with the first set at 4-4, prompting the tournament referee to walk out onto Rod Laver Arena and inform chair umpire Carlos Ramos that play would have to be suspended while the roof was closed. The Australian Open released a statement to explain its response to the heat stress reading. 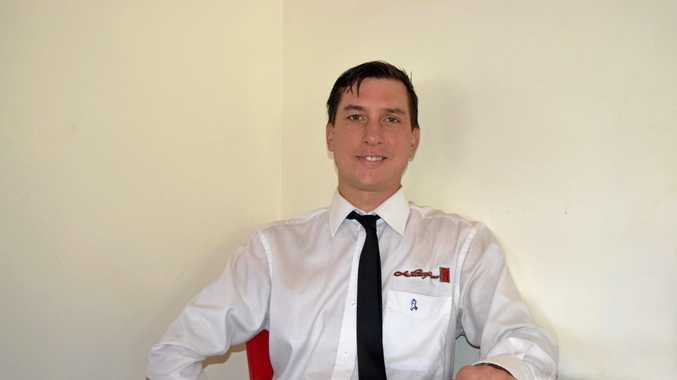 "At 2.47pm the Heat Stress Scale reached 5.0. Australian Open officials immediately stopped play on RLA at an even number of games in the match, closed the roof, and suspended play on the outside courts," the statement said. Tournament officials earlier came under fire for ignoring the weather forecast and keeping the roof open. The decision to open the roof was described as "inane" by tennis commentator Tumaini Carayol, while coach Darren Cahill also slammed the decision by Open organisers. 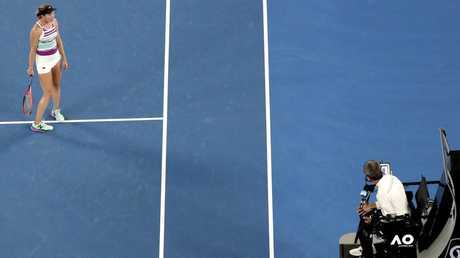 New York Times tennis expert Ben Rothenberg said the decision to follow procedure and not close the roof suggested event officials had learnt nothing from the ugly moment at the 2018 Australian Open where World No. 1 Simona Halep was hospitalised. He said nothing has changed since Open officials were also heavily criticised for their failure to protect players in a 2014 New York Times story titled: "It's not the heat; it's the stupidity." By 3pm the heat stress scale was sitting at 5.5. It had hit 5.9 before 3.30pm. Under the heat stress policy, the roof on Rod Laver Arena is closed and does not open again during the day session. All play on outside courts without roofs is stopped indefinitely until the heat stress scale dips below 5.0 again. The concrete slap court on Rod Laver Arena has on several occasions seen on-court temperatures reach close to 50C on centre court. 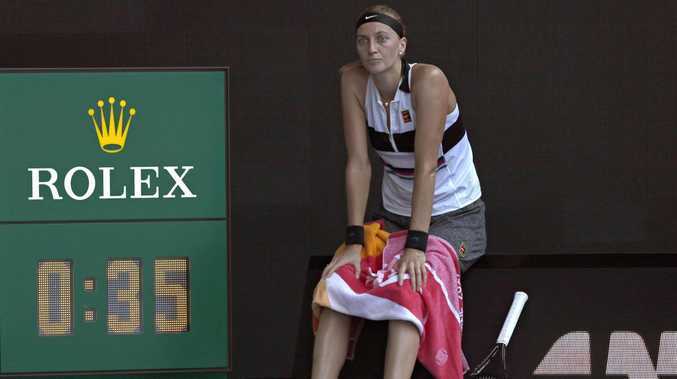 The decision to open or close the roof had a huge impact in the match with Kvitova admitting in her on-court interview that it is no secret that she enjoys inside conditions away from the heat. Danielle Collins was not happy with the decision to close the roof. Collins was fully aware just how significant the moment to close the roof was in the outcome of the result. She began to lose her cool immediately following the resumption of play and initially complained to Ramos and the tournament referee about the decision to close the roof in the middle of the match. She went on to lose the first set in a tiebreaker before eventually being blasted off court in the second set to succumb 7-6 6-0. "There's one person unhappy here about that decision an she's still out on the court and she's going to have a confab with the tournament referee," Channel 9 commentator Sam Smith said when Collins complained during the roof-closing break. "Petra meanwhile is absolutely delighted." Kvitova admitted exactly that after moving through to the final. She said she was even happier than the Melbourne crowd which gave up a huge cheer when the announcement was made the roof would be closing. "The first set was very tiring for myself and I was very nervous, I didn't have a full swing," she said. "I was happier than the fans when the roof closed. I like to play indoors so I think it helped me a little bit."